Location: A short distance north of Hellesdon Road mid-way between A1074 and Hellesdon village where the road crosses the River Wensum. Present state: Much of the site is heavily overgrown with trees and scrub. ‘Marriott’s Way’ cycleway, at this point a poorly surfaced track, lies on the trackbed of the former running line. Access to the station site on foot or two wheels is open and unrestricted from two points on the lane west of the river bridge. Entry is either by the one-time road to the station yard or by following a ‘Marriott’s Way’ fingerpost to ‘Hellesdon Platform’. The bridge that took the railway under the road has gone, filled in and the road lowered. There is no trace of the station buildings. The yard off the road is overgrown although a few traces of tarmac and road-stone survive. The single through platform is intact over about ¾ of its former length. At the begnning of May 2018 it was heavily overgrown but, during that month, a great deal of work was carried out to improve matters. Weeds and creepers were stripped away and, on 29 May, although no-one was on site, progress had been made replacing brickwork on the platform edge with every sign that more would be done. The site is now known as ‘Train Wood’ and there is an active voluntary ‘Friends’ group for environmental work. The posts that once supported the station name-board are still in place, and now have a new name board. The former cattle-dock is extant but the area is deeply buried in woodland and overgrown. Just south of the station the distinctive ‘A-frame’ bridge that took the railway over the Wensum survives on the cyclepath. It was throughly repainted in early May 2018 but, on 29 May, had already received several grafitti attacks. 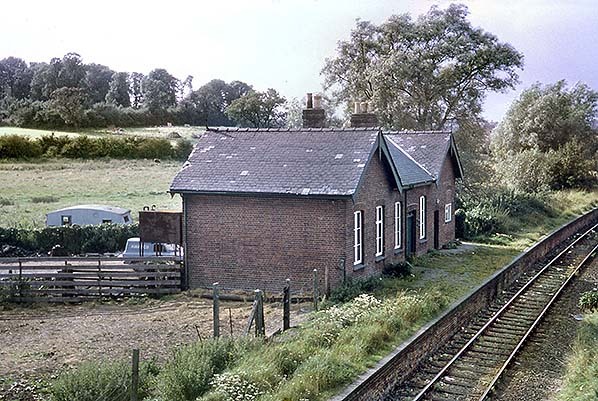 Notes: Hellesdon station, 2¼ miles from Norwich City station, was opened on 2 December 1882 along with others on the Melton Constable to Norwich branch. The station had a single platform on the south-west side of the running line. The platform was built on a slight curve where the railway approached the River Wensum which it crossed on a distinctive ‘A-frame’ steel bridge a little way south of the station. Between the station and the river the railway passed under a road, the bridge made of rolled iron. In 1909 the bridge was rebuilt and strengthened by use of lattice spandrels at the corners, which added support for the road above. 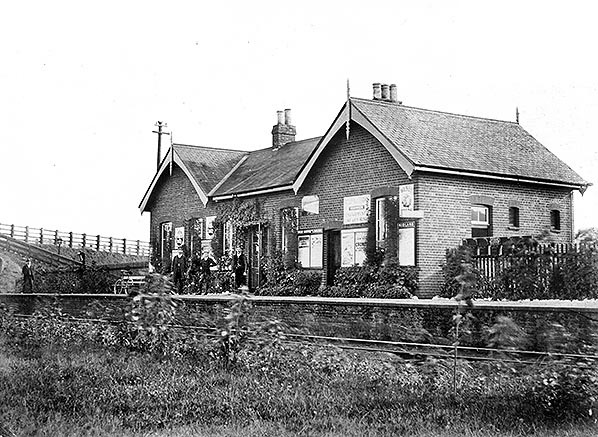 The railway’s engineers, Messrs Wlkinson and Jarvis, provided a larger building than might be expected for a wayside station serving a small community in a village some way from the railway. In his authorative book ‘Stations and Structures of the Midland & Great Northern Railway’ Nigel JL Digby notes, in volume two, that the additional facilities may have been provided because Norwich-bound passengers’ tickets were collected at Hellesdon, a practice that he states continued until 1927. The handsome building had end structures of brick with their roof-lines at a right angle to the platform edge, joined by a centre section with its roof parallel to the platform. The roofs were of slate and the central part sported two chimneys, one each of two and three flues. 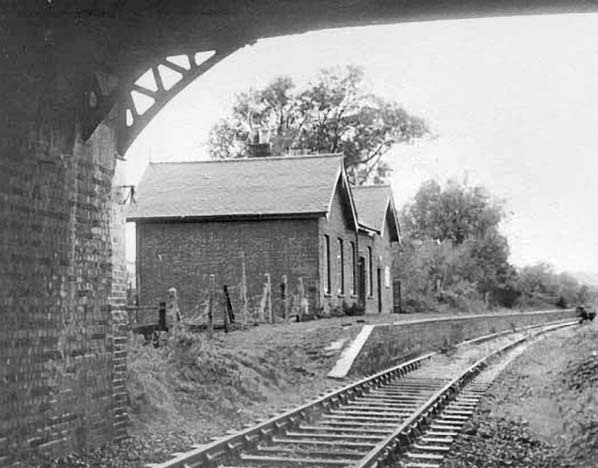 The building was at the Norwich end of the platform and was approached by a short driveway from the public road. There was a steep pedestrian path from the end of the road bridge to the station yard. A short distance from the platform end on the opposite side of the track a set of points, shunted from the north, gave access to goods facilities. Two sidings had a shared endloading dock and a long headshunt ran parallel to the running line north of the station. 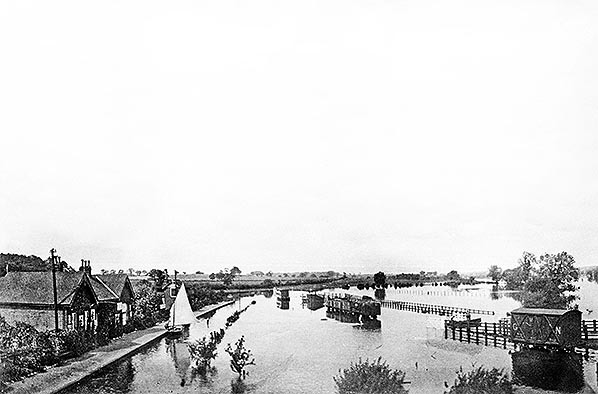 Here were located cattle-pens, used extensively for transit of cattle, many from Ireland, going into lairage on the river water-meadows beside the station. They were en route to market, once fattened at Hellesdon. The goods area was accessed from the public road by a gate close to where the road bridged the river. There was a signal box about mid-way along the platform. It was of the railway engineers’ standard Type 1 construction and built of brick. The station was not a tablet exchange point and the signal box was used only to manage access to the sidings, including appropriate signals to protect train movements. Sometime around the start of the 20th Century the signal box was closed, after which time the points were released at a tablet-operated ground-frame. After closure the ‘box became a porters’ room until, by the mid-1930s, it had been demolished. Looking at an 1887 timetable we see that seven trains for Norwich called to pick up and set down on weekdays, the first at 8.00 in the morning, the last at 10.40pm. One, at 5.55 in the afternoon had come only from Drayton, the next stop to the north. It did not run on Saturdays. Two evening trains called to set down passengers, one of them only if the passengers had come from Cromer or Sheringham. In the up direction only four weekday services bound for Melton Constable or beyond would definitely call at Hellesdon. Two more, one of them running only on Tuesdays and Thursdays, called if required and, except on Saturdays, a local from Norwich to Drayton stopped at 5.35 in the afternoon. On Sundays two trains called, one of them in each direction only by arrangement or by signal to the driver. Monday to Saturday, the final towards Norwich at 8.14pm and northbound as early as 6.59 in the evening. The tables show two expresses each way passing without a stop but, with Hellesdon serving as the ticket platform for Norwich prior to 1927, southbound trains would have paused there. A year after nationalisation the 1949 tables show a somewhat more intensive service on the line. Hellesdon saw nine down trains, ten on Saturdays, including one in the early evening conveying through carriages from Birmingham. A mid-morning up train balanced the working. Altogether eight up services stopped but the final service of the day was as early as 5.35 in the afternoon. Later trains passed by without stopping. Hellesdon station was just 2¼ miles from Norwich City terminus and not in a particularly convenient location for the village east of the station or for the expanding city suburbs on the higher ground to the west. Post-war, both were served by regular buses operated mainly by Eastern Counties Roadcar Company. Thus railway passenger traffic was light and the station closed on 15 September 1952. 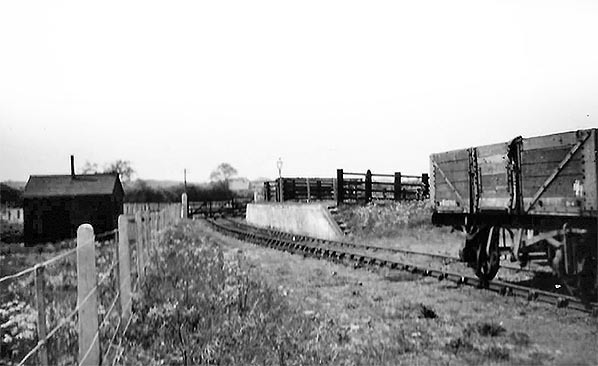 A single member of staff was retained to manage goods traffic which continued until the line between Lenwade and Norwich closed in March 1969. 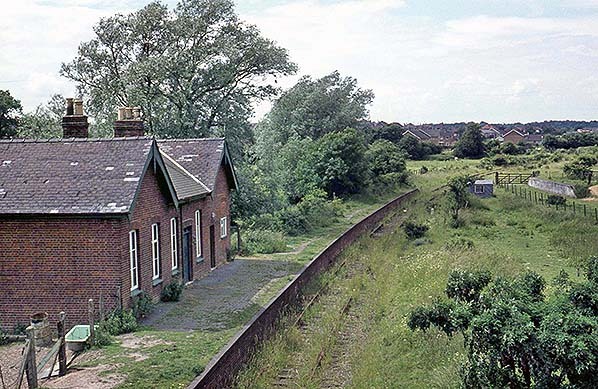 After 1962 the site was unmanned and, by then, the tablet release for the sidings was in the open, with the siding area fenced off. Nigel Digby reports that the remaining traffic was road-stone for use by the County Council. The goods yard closed on 13 July 1964 although working time tables after closure to passengers show nothing booked to call at Hellesdon - not even on an 'As Required' basis.The line to Norwich City remained open until 2 March 1969. Cross Man’ on his website, had a number of occupiers before it was finally demolished in 1975. He reports that it was was used as a Sunday School and a youth club and then by a local catering company (Anglian Culinary Services), but before its demolition had possibly become a drinking-den for local youths. Route map drawn by Alan Young. Tichets from Michael Stewart. The ‘large pavilion’ type of Wilkinson & Jarvis station at Hellesdon in 1902, the breeze stirring the plants in the station garden. The steps down from beside Bridge No. 250 can be seen on the left. Despite the M&GN, GNR and MR noticeboards, the station is still very much in its Eastern & Midland condition, with flat-bottom rails and the original paled fencing. 25” 1:2,500 OS map shows Hellesdon station as built. The village is some way off the top right of the map and the road to Norwich at the bottom middle.The signal box on the platform was only used to control access to the two sidings opposite the platform. 1928 25” 1:2,500 OS map shows little changed at Hellesdon station over the years. This map shows more annotation than the earlier map and includes the signal box which had, by that time closed and was in use as a porters’ room. 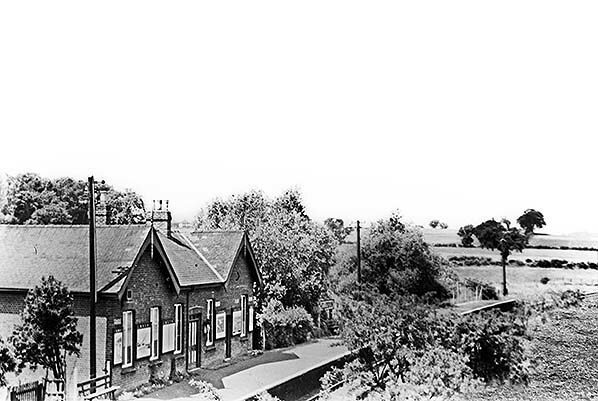 Hellesdon station showing the building and part of the signal box probably about 1930 but possibly earlier. The original flat bottom rail had been replaced at some point. The signal box had closed around the beginning of the 20th Century but was used for many years afterwards as a porters’ room. It was demolished by the mid 1930s. 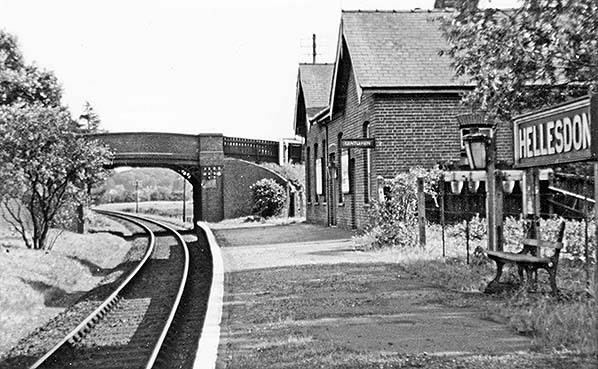 Hellesdon station looking south towards Norwich, probably around 1950, shortly before closure to passengers. There were posters present and the fire buckets were in place suggesting that it was open for business, although the weeds and broken seat suggest a run-down operation. The lattice spandrels adding support for the road since 1909 can be seen on the bridge. 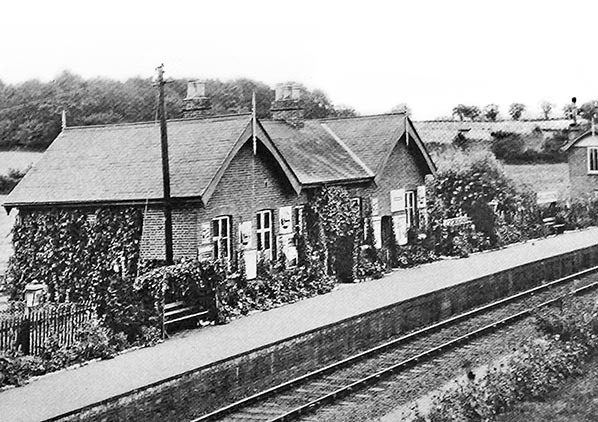 Hellesdon station in 1868. The station name board had gone but the building appears to have been intact and modified. At some point oil heating must have been installed and a rusty tank can be seen on the forecourt side of the building. At this time the building was in commercial use. Looking north-west from Hellesdon Road bridge c1970. The line into Norwich City is now closed to all traffic and is now overgrown; the station building remains in commercial use. The cattle dock is seen on the right just inside the gated entrance to the goods yard.